This weekend, Sydney will complete a long and predictable narrative that cautions us yet again about the danger of relying on tourist experiences as a basis for transit planning. The Sydney Monorail, built in imitation of Seattle's, has now been through the predictable phases of exuberance, delight, irritation, and boredom, and has finally arrived at the point of being more of an obstacle than a service. The Sydney Morning Herald interviews longtime monorail fan Michael Sweeney who says what little can be said in the thing's defense. He even uses the word groovy, reminding us (and the interviewer) that he's expressing a definition of coolness that prevailed in one historical moment. There was never any reason to assume the monorail would be cool forever. Why? The usual things. It was conceived as part of a redevelopment, designed to be part of the excitement that would sell expensive real estate. Like many new North American streetcars, the point was solely to achieve a development outcome and nobody much cared whether it would be useful as transit, especially decades into the future. It was a tiny one-way loop, only about 1 km in diameter, connecting some key tourist destinations into downtown. Even for tourists it had limited use because — like most North American streetcars again — the route was so short that you might as well walk, as most people do in this area. As urban design, the monorail wasn't that bothersome when it sailed over the open spaces of Darling Harbour, but when it snaked through the narrow streets of the CBD, it was a heavy weight in the air on narrow streets that were already oppressive to the pedestrian. It's not surprising that it took a new redevelopment plan to sweep away the toys of the old. Still, the calculus came down to this: It's not very useful. If you want to get somewhere on the loop, and back, you might as well walk. And there are far fewer people riding it than walking under it, perceiving it as an oppressive weight. So it's coming down. Last ride is this Sunday. Below is the portion covering inner-city Sydney. That's the largest continuously dense area of the region, and the one you are most likely to know as a tourist. The CBD and Harbour Bridge are at the northern edge of this diagram, the airport is in the south, and the beaches are in the east. The artist is Kevin McClain, who has just moved to Seattle to join the Accessible Services section at King County Metro. He tells me it's to be published on the Easy Transport website – a North Shore organisation devoted mostly to special-needs services. It's odd that such an organisation has produced the most useful diagram of Sydney for people who just want to get around all day without waiting long, but that's exactly what this is. The maps published by the bus operators — download here – emphasise the complexity of the network by making all the routes look equally important, thus concealing patterns of frequency that would show the customer where they can move freely and easily. In this it's like most transit maps from before the advent of frequent network mapping. (For many great examples of frequent network mpas, see my Frequent Networks category.) The Government deserves credit for fostering the Metrobus product, which is meant to be the future frequent backbone of the network, but there are still many frequent corridors that don't carry the Metrobus logo and M-number, so a Metrobus map is not quite a frequent network map. The branding of Sydney services is still a work in progress. The map reveals many issues that are hidden on the current public maps (download here). Those maps make all the routes look equally important and thus give the impression of intimidating complexity. Public transport in Sydney has historically functioned in modal silos, with rail, bus, and ferry planning largely unrelated to each other and sometimes even seeing each other as competitors. That's meant to change under the new integrated transport authority, Transport for New South Wales, which has begun thinking about all the modes together. I hope this diagram will help them visualise the problem and conceive new solutions to it. If you care about people who move around all day, who are inclined not to drive, but who value their freedom and won't stand for being stranded for long stretches of time, this is your public transport network. The gaps in this network are the gaps in people's freedom. Can Sydney do better? Breakthrough news on rail battles in both Toronto and Sydney, both of which I posted on recently (Toronto, Sydney). Sydney's state government has made it official. The one-way loop of the Sydney Monorail, designed to decorate the tourism-convention playground of Darling Harbour without being very useful to anyone, is to be torn down. While the decision is being described as a move toward light rail — plans for which are definitely moving forward — it's really just a decision to invest in transit lines that do useful things — such as running in both directions, running efficiently enough to justify reasonable fares, and connecting with many other services so that people can go where they want to go, not just where you want to take them. Toronto City Council has definitely scrapped Mayor Rob Ford's plans to spend all of the city's transit resources on a few expensive outer-suburban subway segments designed to serve small parts of the region. The move opens the way to move forward on more cost-effective light rail projects that will enrich mobility across the entire city. This is an important day for Toronto. We are on track for a [light rail]-based plan and for a more detailed evaluation of our transit future than we have seen for decades. Talking about one line at once, about fundraising for one project at once, is no longer an accepted way of building the city. That's the key. The Sydney Monorail failed because it was "one line at once" — a project conceived in isolation with no interest in being part of a complete network. And in Toronto, a city with numerous desperate rapid-transit needs, planning will no longer pit neighborhoods against each other to the degree that Mayor Ford wanted to do. Instead, Toronto can move forward on projects that fit together into a more complete rapid-transit grid — serving "anywhere to anywhere" trips. Finally, a warning to technophiles!! Technophile commenters will doubtless chalk this up the Sydney decision as a defeat for monorails in general. I disagree. It's a defeat for one-way loops, poor connectivity, and symbolic as opposed to actual mobility. The monorail didn't fail just because it was a monorail, but because it was a poorly designed line. Likewise, the Toronto outcome isn't a victory for light rail or a defeat for subways, but merely a commitment to better network design. Lanes that protect transit's speed and reliability are only as good as their enforcement. San Francisco, like many cities, has long had a few lanes whose enforcement was so spotty as to render them advisory. Now, the city is getting serious, with camera enforcement and significant fines. I think another feature will eventually be necessary: Full painting of bus lanes in the same way that we usually paint bike lanes, along with signage on approaching intersecting streets, so that there is no "I didn't know" excuse. Sydney, for example, paints its bus lanes deep red, with gaps at the points where cars can cross for turns. In addition, if you approach as a motorist on an intersecting street, you will see a sign with a lane diagram of the street you're approaching, so that there's no excluse for turning into a bus lane. Fines (stiff) are often advertised prominently. sydney: monorail soon to be scrap metal? The state government that rules Sydney is giving signs that it's ready to tear down the city's monorail, ostensibly for a rebuild of the convention centre but also to remove some obstacles to surface light rail, including game-changing new line down the middle of Sydney's CBD spine, George Street. Jake Saulwick has the story in today's Sydney Morning Herald. A source from one consortium [bidding to build a new convention centre] said no decision had been made ''but the word from the government is 'don't let the monorail constrain your thinking' ''. Like many transit toys, it was built cheaply on the assumption that the joy of the technology itself would transcend its lack of usefulness. Its most obvious use is for travel between the convention/exhibition area on the west side of the loop to the city centre in the east, but the key stations on the west side of the loop, serving the convention/exhibition area and Paddy's Markets, are attached to parking structures, offering an unattractive walk to the destination itself. The fare is $5.00. Meanwhile, it's less than 1.5 km (1 mile) walk from one side of the loop to the other, mostly along reasonably pleasant paths that lead to the front door of your destination, though to be fair there is one elevated waterfront freeway in the way. I lived and worked in inner city for five years, crossing the monorail's service area on foot several times a week. Twice in that time, in very bad weather, using the monorail made sense to me. The monorail is a barrier to light rail, indirectly, because its pillars form a bottleneck in a potential north-south traffic lane on Pitt Street, and this lane could be useful in rearranging street uses to create room for a light rail line the whole length of George Street, the largest continuous north-south street in the city's core. Light rail is being designed to be useful. It will be in an exclusive lane (which is why it's not being called a "tram") and it will form the common CBD segment for several lines branching out in several directions, serving high-demand corridors in the inner city. Its high capacity (in the sense of passengers per driver) and its two-way service in high-demand places will make it a real transit service, unlike the tiny one-way loop of the monorail. Very few people really want to travel in circles. Loops are intrinsically closed, turned inward on themselves, impossible to extend without disrupting existing travel patterns. That's why one-way loops are never a good starter project for a technology that's expected to expand its relevance in the future. 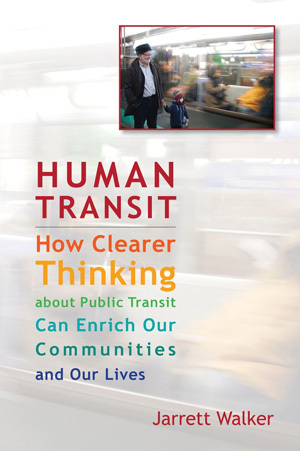 For more on those principles, see Chapter 4 of Human Transit. Finally, monorails are fun to ride, but most people experienced this one from being underneath it. This was just a single beam for one-way loop service, causing all the problems above, but it was still much-disliked, especially in the narrow streets of the highrise core where it added to the sense of overhead weight above the pedestrian. To be fair, it's less oppressive than, say, the Chicago "L" or many other downtown viaducts. A transit advocate might fight hard for exactly this kind of visual impact if it was the only way to get useful two-way service through a high-demand area. In fact, one of the best uses of monorail is in historic and very crowded areas where the combination of archeological and ground-plane impacts of any transit service simply mandates elevated as the least bad solution — parts of New Delhi, for example. But the Sydney monorail had few of these benefits. Perhaps it was just a toy, and Sydney has outgrown it. Kevin McClain is currently a Project Officer at Easy Transport, the Regional Coordination Office for Community Transport in Northern Sydney. He holds a masters degree in Transport Management from the University of Sydney. Recently there has been a lot of discussion about Frequency Mapping on Human Transit starting with this post. Here in Australia we have seen frequency maps for Melbourne and Brisbane, but other than this map, we haven’t seen one for Sydney. Inspired by the efforts so far, I set out to try and make a frequency map of the services in Northern Sydney, the region where I currently live and work. This effort was also driven by the desire to reduce the number of resources a transport user would need to consult in order to plan a trip. Currently there are seven different system maps for services in the Northern Sydney Area alone: five bus maps (each covering different areas), one rail map and one ferry map. Ultimately I ended up developing two maps: One frequency map of all of the services in Northern Sydney and one map of all frequent services across all of Sydney. I work for Easy Transport , which provides transport information for seniors and people with disabilities. We also serve as the regional coordination office for Community Transport in the Northern Sydney Region and provide travel training to residents. Our Northern Sydney map was developed to be a tool that could be used by the travel training program and potentially help promote our service. One of the challenges I have struggled with is the fact that there are a variety of service types in Sydney (buses, trains, ferries, and light rail) and people seem to want to be able to tell the difference between the service types when they look at a public transport map. This makes frequency mapping more difficult. In the Spokane map, all services are provided by bus. There is no need to show service types. Creating a map that shows service types and then shows frequency within each of those service types quickly gets complicated. One of the main points of both maps is to show where the frequent bus services are in Sydney. While train frequency is also important, there has been a recent expansion of frequent bus services across Sydney with the introduction of the Metro bus services (in red on the map of all frequent services). I think that it is important to show how these new services, along with existing frequent bus services, fill in some of the gaps. 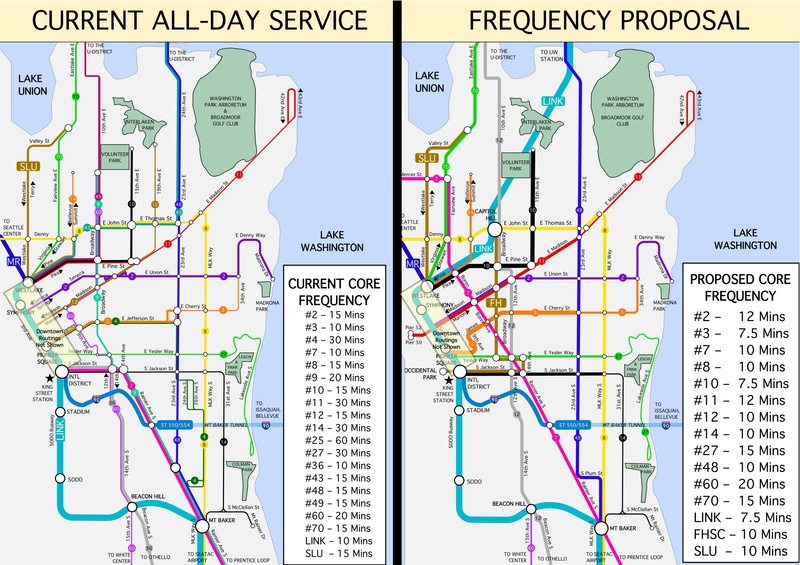 Each of the maps show the trade-off between providing more information and a clear map that emphasizes the frequent services. Try planning a trip on one version of the map and then the other. Does the level of information provided affect the routes you chose? Are you able to figure out where the routes are going? Are there areas that are particularly confusing? Which version of each of the maps do you prefer? These maps are still in draft form and I would welcome comments and suggestions about how the maps might be improved. And yes, there are errors on both of the maps. Corrections or any frequent routes that I might have missed are also welcome. You can send me feedback either by commenting on this post or by emailing me at kevin@easytransport.org.au. The company that runs Australia's immigration detention centres has made the short list to operate Sydney's ferries. Harbour City Ferries and Transit Systems are the other two bidders on the list. Security company Serco has a contract with the federal government to run Australia's detention centres, which are the subject of a parliamentary inquiry after recent protests and unrest among detainees. Insert your own quip here.